The Office of Procurement Diversity oversees Supplier Diversity at the University of Illinois System. We are committed to vendor diversification by ensuring that diverse businesses (see definition) are included in the University procurement process. The Supplier Diversity Program provides access to procurement opportunities by creating an equitable and competitive business environment through encouraging campus departments to proactively consider qualified certified businesses owned by minorities, women, persons with disabilities, and veterans for their contracting needs. The State of Illinois declares that it is the public policy of the State to promote and encourage the continuing economic development of minority, women, and persons with disabilities owned businesses and are provided the opportunity to participate in the State's procurement process as both prime and subcontractors. 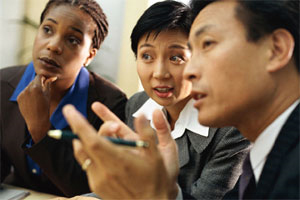 The Business Enterprise for Minorities, Women, and Persons with Disabilities Act, "BEP ACT", (30 ILCS 575/) establishes that "not less than 20% of the total dollar amount of State contracts, as defined by the Secretary of the Council and approved by the Council, shall be established as a goal to be awarded to businesses owned by minorities, women, and persons with disabilities." Through the Veterans Business Program (VBP), (30 ILCS 500/45-57) state agencies and universities are encouraged to spend not less than 3% of the total dollar amount of State contracts with VOSBs and SDVOSBs. *Must be Illinois resident and with a home office in Illinois. The following Job Aid video shows a process for searching for Diverse Vendors. Chicago Anchors for a Strong Economy (CASE) is an initiative sponsored by UIC's Chancellor Michael Amiridis. Local CASE Anchors such as the University of Illinois at Chicago, Northwestern University, Rush University, City of Chicago and Cook County collaborate to foster strategic relationships with small businesses who can supply their needs to build economic vitality across Chicago's neighborhoods. CASE Overview Video from Mimi Productions Chicago Video on Vimeo.